An audience at Bowery Ballroom stood still with quiet chatter and anticipation on a warm March night, almost exactly a year ago today. The audience consisted of primarily older high school kids, with the exception of the few outliers who may be in the lower to lower to mid twenties. The band they all await is known as Tally Hall, and they have become well known not only for their exceptional harmonies and catchy tunes, but also for their immaculate appearance. Each member of the band can be seen wearing a white dress shirt, and either a yellow, red, green, blue, or silver tie. On that particular evening of March 4th, 2010, everyone expected the full band to come out on stage and play a killer show as they are known for their exceptional live performances. What the audience did not expect was for an entirely different man to come out in place of the band’s lead singer, Joe Hawley. In front of the audience stood Tally Hall, and a tall, shaggy-brown haired man dressed in Joe’s normal band attire with a small exception: a white dress shirt, black tie, (as opposed to Joe’s red tie) and black dress pants. With no explanation as to where the band’s front man was on that particular evening, Tally Hall started to play their usual repertoire of songs. While the audience was still excited to see the band play, there was certainly an air of confusion and mystery due to the lack of explanation regarding Joe’s mysterious disappearance from the band. And then all of a sudden, one of the band members quietly mentioned, “Joe was not able to make it to tonight’s show, so we have asked our good friend Casey Shea to temporarily step in.” But he was not stepping in for just that particular show at Bowery Ballroom — Casey had replaced Joe for the entirety of the tour. For many, Tally Hall’s March and May tours were the last time the band was seen in the public eye. They performed once more at a show with Matisyahu in Brooklyn, late November 2010. Through all the shows and ticket sales, not a word was mentioned from the band to their fans with regards to a new album, or their rumored record deal with Atlantic Records. The fact was, that they were not doing interviews, and they were not releasing any news on possible progress they were achieving with recording a second album. A long period of time has passed since their first album, and their fans were, (and still remain) thirsty for knowledge. For a band that had so many fans from the get go, one might imagine that their lack of public display or lack of effort to be in the public eye was a potential marketing strategy. Several bands have done it before, and it wouldn’t have been surprising if perhaps they were holding out on publicity so that they could build up hype. This was a recurring trend with those that seemed to be closest to them. David Lizmi (bassist and synthesizer of Via Audio, another friend of Tally Hall’s) responded similarly when asked about Tally Hall. However, the one thing that many people close to the band seem to agree on is the new album that is set to release this year. “Something I can tell you: The second record will be coming out. I’ve heard it and it’s really great. Definitely get pumped for that,” Tommy said. Andrew Horowitz, Tally Hall’s keyboardist, was able to shed some light on some of the biggest mysteries surrounding the band’s name. As it turns out, the band’s sophomore album, titled Good and Evil is recorded and technically ready for release in the coming months of 2011. The album was recorded in a month and a half, as opposed to their first album, Marvin’s Marvelous Mechanical Museum, which took four months in studio. “The first album came about organically, because none of us were musicians per se. We created music for fun. No expectations for ourselves, no plan in studio. We only spent four months in studio because we did a lot of experimenting,” Andrew said. Marvin’s Marvelous Mechanical Museum [MMMM] could be described by some as an immaculate sound rehearsed and perfected by each member of the band–one hundred percent effort on every track. That was, essentially, how the band got its reputation for being so put together. While listening to their first album, one could hear catchy tunes and rhythms, humorous lyrics, and theatrical voices. 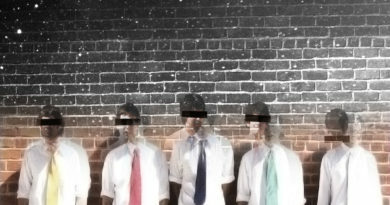 While the same could be said for many other indie bands, all trying to be unique and truly individual, Tally Hall established themselves with their own sound. They were truly unique. Good and Evil on the other hand included a plan, budget and a label. Since a lot of people were involved in the production of the album, they didn’t have as much experimental time. Coz Baldwin, Webmaster of Hidden In The Sand, (Tally Hall’s fan site) had nothing but promising expectations for Tally Hall’s latest record. “My speculations are very high. They had a multi-platinum selling, Grammy-nominated producer working with them to create a stellar sounding record and their songwriting has evolved 10-fold from their last album,” Coz said. “From what I’ve heard (live performances), some of these songs are even more addicting than those on [MMMM] and I know the production will bring them to a whole new level. The truth was that over the course of a couple of years, Tally Hall became signed with major record label Atlantic Records. After they recorded the entire album, they were no longer faced with a record label that was all about the music, but an actual business, just trying to make some money. Nothing was actually said with regards to whether or not Tally Hall remains to be actually signed with Atlantic Records. However, as per the Atlantic Records website, Tally Hall is no longer listed as one of their signed artists. In addition, Tally Hall was listed as signed with Quack! Media (their primary indie label) on their booking agent website, Red Ryder Entertainment. Interestingly enough, it can also be seen on the Red Ryder Entertainment website that Tally Hall is looking to tour from July 22nd, 2011-August 22nd, 2011. Andrew confirmed this speculation, saying that Tally Hall was looking to potentially tour in the summer of 2011. A couple other questions remained, one of them being, the story behind Joe Hawley’s disappearance from the tour in March 2010. Coz said that the band, “was suffering from some creative difference in the past, which may or may not have played a small role in Joe’s absence.” Andrew could not comment on this, however, he was able to say that all band relations are fine as of now. It seems safe to say that Tally Hall has essentially been to hell and back. Andrew made it apparent that the band felt terribly about how they haven’t been able to relay any information to their fans. “We all like performing, and we all like being able to create, but these past couple of years have been so complicated that we haven’t been able to communicate to our fans,” Andrew said. However, the band seems to be safely moving forward in an attempt to regain their status and fans within the music world. They are certainly aware of how their lack of news has affected their fan base, and while they are still building new management and relationships, they are certainly headed in a positive direction.